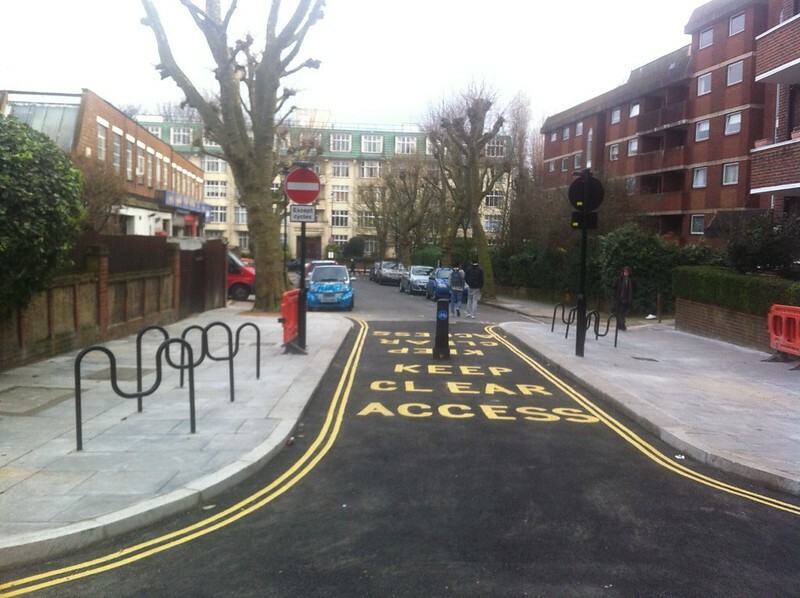 About a year ago, we negotiated with Camden Council to use their spare cash in building a variety of small measures that would make cycling more pleasant. 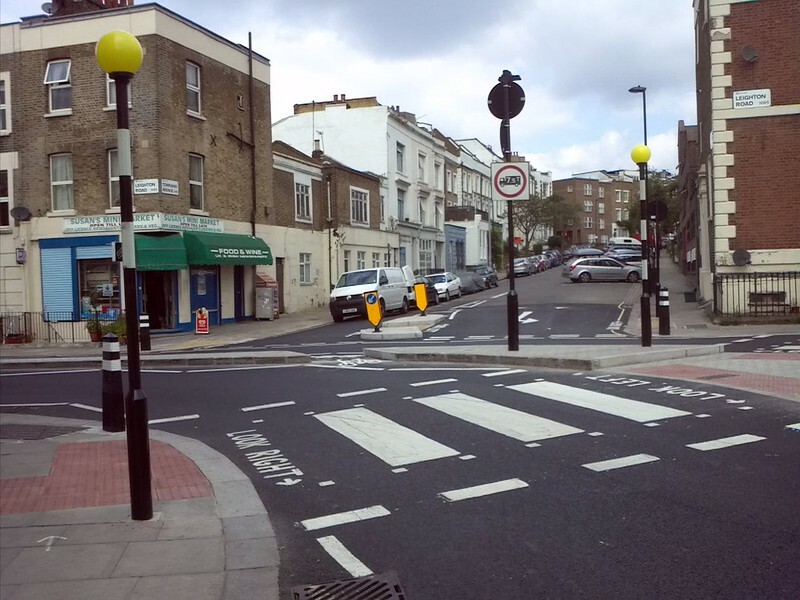 About a year ago, we negotiated with Camden Council to use their spare cash in building a variety of small measures that would make cycling more pleasant. This post will give you an idea of what sort of things are feasible so that you can give us suitable suggestions in the future. Thanks to the members who have given us suggestions so far. 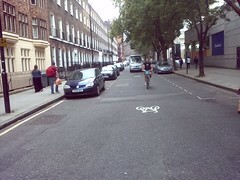 Dropped kerb at Western end of Northington St. WC1, leading to Rugby Street. This completes an informal way to cycle across the square as there was already a dropped kerb on the Rugby Street side. 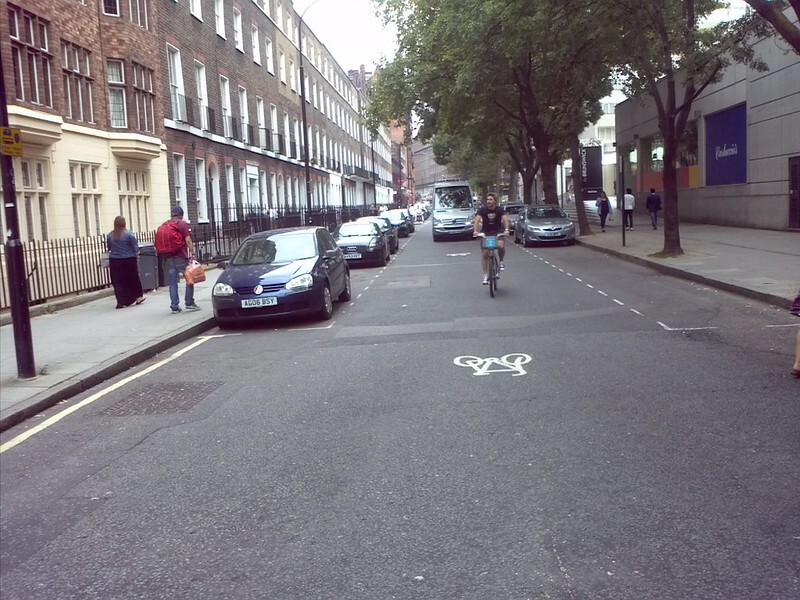 Cycle gap in road closure between Kelly Street and Castlehaven Road. Helps avoid Hawley Road, and the 393 bus at Castle Road. 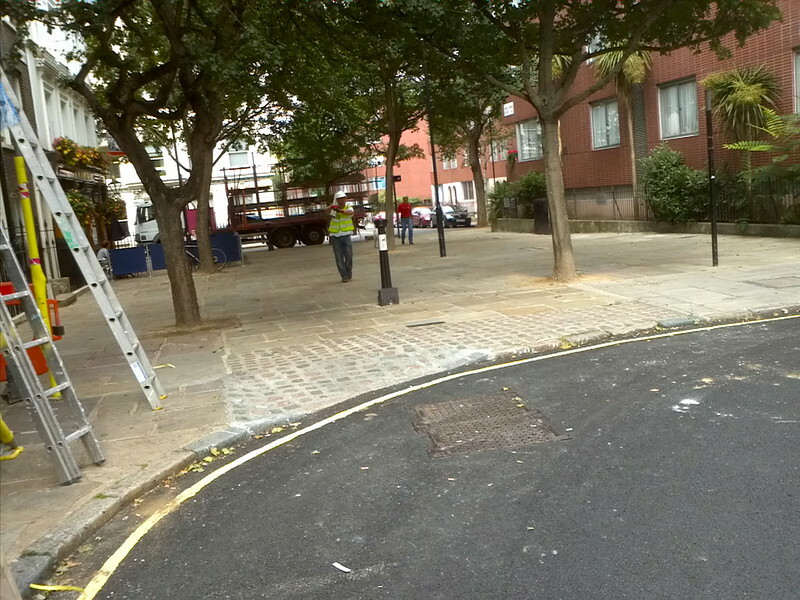 Dropped kerbs at the junction of Gough Street and Calthorpe Street. This is an old road closure with bollards and all that was needed was dripped kerbs on both side. Re-site sign. 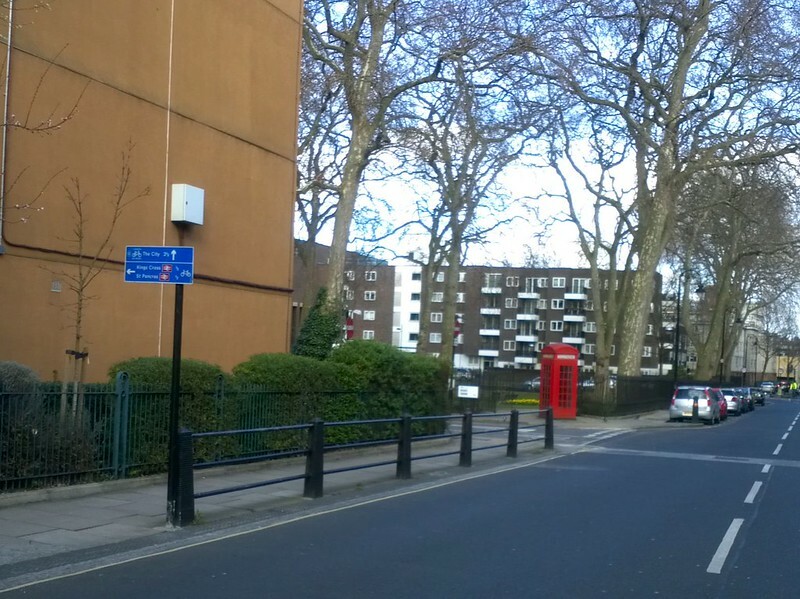 Since the western side of Regent’s Square was made two way for cycling the sign on south side of Regent’s Square indicating the route to Kings Cross is in the wrong place. It needs to be moved westwards onto Tavistock Place before the south west corner of Regents Square. 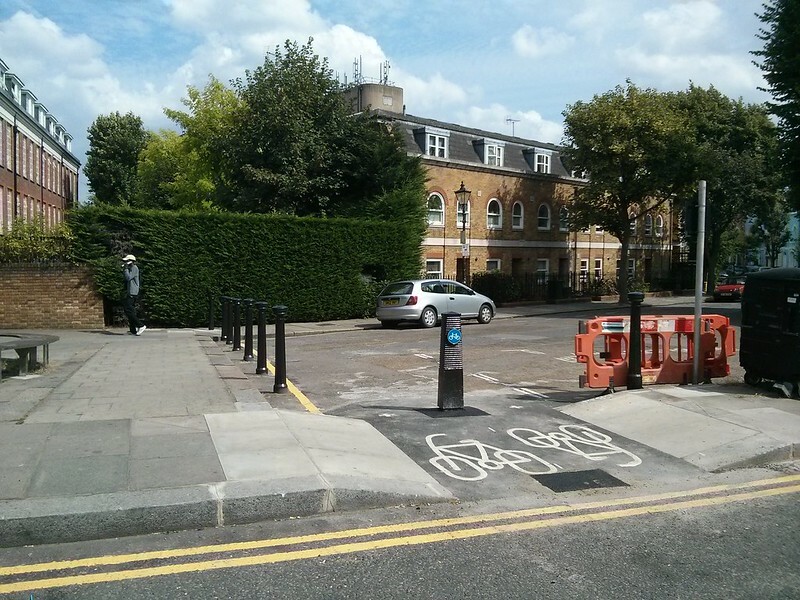 Improve cycle access through the very awkward barriers on Lissenden Gardens at the junction with Glenhurst Avenue. Previously there was an ancient gate in poor condition which was difficult to pass with a loaded bike. Logos on North-South Route. Please could the bicycle signs painted on the road in Camden Square & Stratford Villas be repainted? They are so faint they are barely visible! 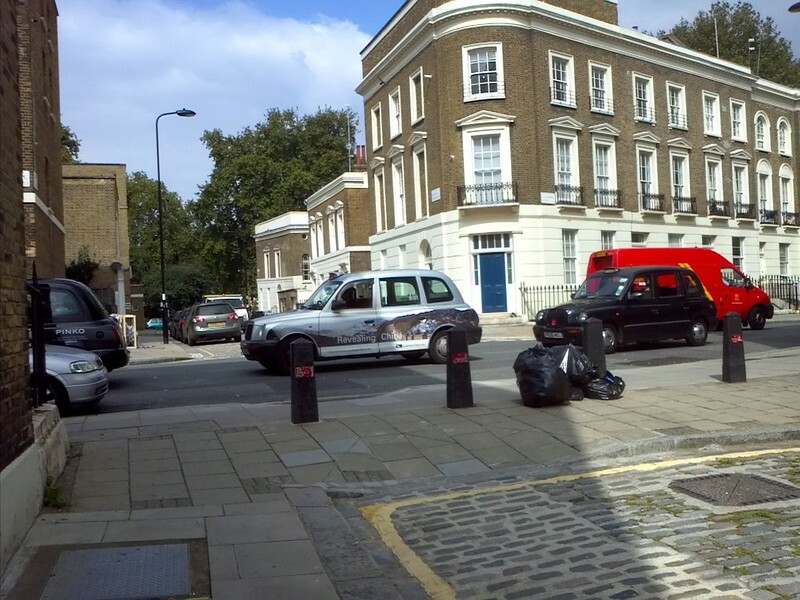 I would especially like a BIG one at the bottom junction with Rochester Sq, where cars often come round very wide, well over into the cyclists’ space. Logos in Bernard Street, running along the south of the Brunswick from Marchmont St to Grenville St. To avoid the dooring zone you have to ride a certain distance out from the parked cars (normally a continuous line on both sides of this one-way street). 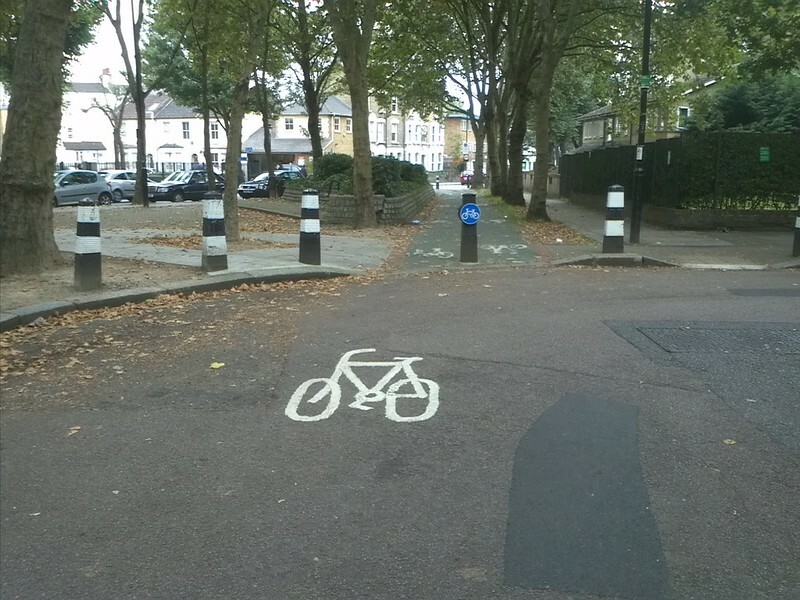 But if you ride at exactly this distance you leave a gap on your other side just big enough for motors to think they can squeeze past, far too close, as they overtake. So to be safe you have to ride in the middle of the road. It’s only a short stretch but motors really, really object to this: I have been hooted and sworn at so often I’ve abandoned this route. Suggestion: paint bike icons on the road, in the middle. 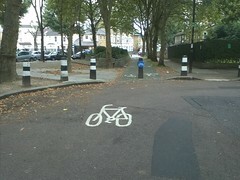 Thus indicating to drivers that bikes are to be expected in the middle of the road. It won’t stop all the aggression but it should reduce it. 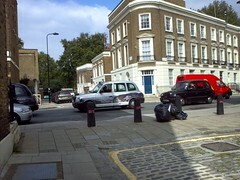 (Bernard Street is the only road I know of with exactly this problem but I’m sure there are others). Poor road surface in Camley Street near Granary Rd and the rail bridge. This has been repaired but a photo would not be very exciting. 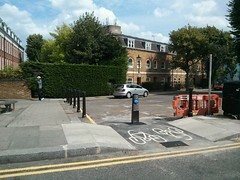 A new junction table has been built at the junction of Leighton Road and Torriano Avenue and it includes a gap to enable cycles to carry on to the northern part of Torriano Avenue. Several people have written to say how much they like it.